The beach run, which opens and closes Chariots of Fire, has become one of the most iconic scenes in British cinema, often imitated and, as a multi-Oscar winning film, widely recognised at home and overseas. For St Andrews, this short sequence, depicting a group of runners along the West Sands beach, may be the defining visual depiction of the town. However, it was only by chance that Chariots of Fire came to be filmed in St Andrews. The fictional setting for this opening sequence is in fact Broadstairs, Kent, so how did the crew find themselves filming more than 500 miles away in Fife? Producer David Puttnam recently explained that the selection of St Andrews was ‘happenstance’, with St Andrews chosen, as is often the case, for economic reasons. As filming was taking place in Crieff and Edinburgh, the production looked to ‘consolidate our locations’ and to find a suitable location in Scotland. 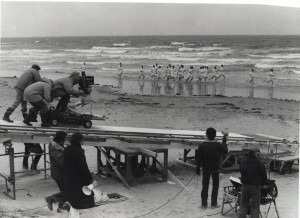 The initial filming in St Andrews took place on 24 April 1980. ‘By 7.30 am’, the St Andrews Citizen explained, ‘cameras were being rolled out on to the West Sands and workmen were busy camouflaging buildings that looked post 1920 and covering cars that had been left around the beach area overnight.’ The then University residence, Hamilton Hall (formerly The Grand Hotel) was now renamed for the shoot The Carlton Hotel. The St Andrews Hotel served as a base for the cast and crew, with extras gathering there before getting into period costume. Writing of his experiences in The Citizen, one extra commented that most of those waiting ‘had been offered the chance to be a film star for the day in local bars the night before’ (The Citizen, 3 May 1980, 7). 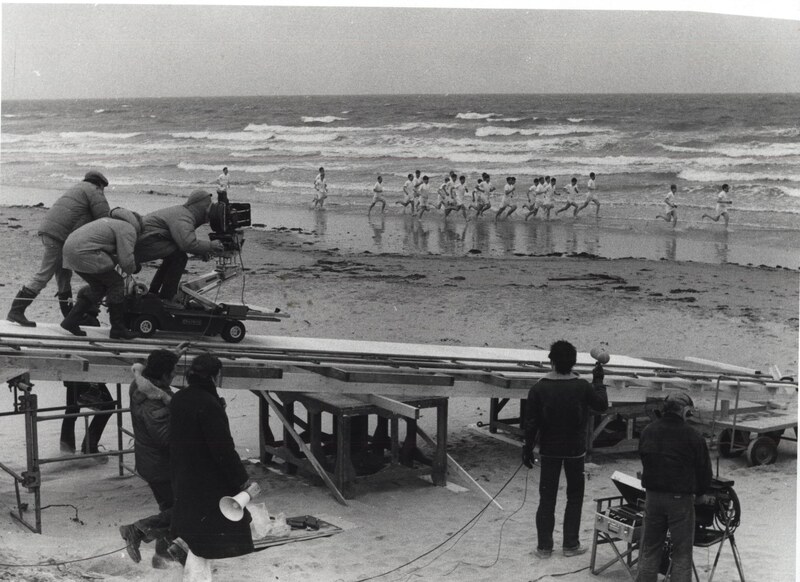 The more athletic extras were tasked with running repeatedly along the beach, as the tracks that the camera was running on kept on sinking into the sand requiring reshoots. These extras were brought together by local Olympian Donald Macgregor, who had finished 7th in the marathon at the 1972 Munich Olympics. Now working at Madras College, Macgregor was approached by journalist Sandy Sutherland in late 1979 and tasked with assembling a team of extras from the University cross-country runners and Fife Athletics Club. Macgregor declined to take part himself as he was reluctant to take a day off work (Macgregor, 2010). If Macgregor was reluctant to leave the classroom for the film shoot, other locals were even more reticent – and in some cases resistant – to the presence of a film crew within the town. Shortly after the filming, Regional Councilors spoke out against the disruption caused by the shoot. The main complaint centered on the ‘fact that Links Place was closed to traffic for a few minutes.’ Regional Councilor Tony Jackson told The Citizen that ‘he personally objected very strongly to time being wasted helping film people’ and did not appreciate roads being closed for a ‘frivolous reason’ (The Citizen, 3 May 1980, 1). This reaction clearly illustrates changing attitudes towards film production in the last three decades. Although some councilors did acknowledge that the town could benefit from publicity upon the film’s release, in hindsight both the opposition and support for the film within the town appears short sighted. In writing of the benefits of the film, The Citizen commented only on the additional income brought in to hotels, businesses and shops over the few days that the production visited St Andrews. The subsequent success of Chariots of Fire has left a lasting legacy on St Andrews. Aside from the international recognition provided by the film, the film is memorialised in a myriad of ways: a heritage plaque commemorates the filming on the West Sands; a local bar is named ‘Chariots’ and contains a historical picture of the film’s protagonist Eric Liddell outside, while hotels and local businesses publicise their connections with the film. Furthermore, events are regularly staged revisiting and recalling the film, such as the annual charity ‘Chariots’ fun run, which takes place in period costume on the beach. The celebration of St Andrews’ position within the film – and within the historical events told therein – occurs despite the town’s omission from the film’s narrative. David Puttnam recalled watching the film with Sir Sean Connery, an honorary St Andrews graduate. As the camera pans over the beach to reveal the famous 18th hole at the Old Couse – one of the most iconic sporting venues in the world – the voiceover introduces ‘Carlton Hotel, Broadstairs.’ At this point, Connery tapped Puttnam on the shoulder and informed him, ‘that’s not the Carlton Hotel.’ For local audiences, there is a particular recognition and pride within these local scenes. Local audiences have been known to cheer the appearance of the beach and heckle the incongruous announcement that this familiar scene is supposed to represent Broadstairs. Even beyond St Andrews, the internationally familiar image of the ‘Home of Golf’ encourages viewers to acknowledge and transfer the defiantly stated ‘Broadstairs’ for the undeniably familiar St Andrews. As Britain prepares for the Olympics, Chariots of Fire’s position within the country’s cultural heritage is further solidified. Advertisements for the Olympics, for example the Sun newspaper’s campaign, directly reference the iconic beach scene, while other crews (some more closely associated with the games) have recently filmed in the town. In preparation for the Olympics, the film will receive a nationwide re-release through a newly re-mastered digital print, while a stage show has recently opened in London. The film is able to traverse different historical moments – set in 1924, filmed against the backdrop of the 1980 Moscow games and now recontextualised in relation to the London Olympics. For St Andrews, the film manufactured a local connection to the Olympics, which the town continues to celebrate to this day, not least with the arrival of the Olympic torch on 13 June 2012. ‘Technical Hitch for Film Crew’, The Citizen, 3 May 1980, 1. ‘The Rocky Road to Stardom’, The Citizen, 3 May 1980, 7. Macgregor, Donald, Running My Life (Pintree Press, 2010). Tom Rice and Joshua Yumibe, ‘Interview with Lord Puttnam’, 13 March 2012. Tom Rice and Joshua Yumibe, ‘Interview with Donald Macgregor’, 6 June 2012.